It’s a favorite event among Multnomah Co. Master Gardeners, our annual Winter Greens Gathering. Enjoy an evening with fellow Master Gardeners enjoying sweet and savory treats, and warm beverages, while Chapter gurus and friends offer guidance in making your wreath, swag, centerpiece or other creative decorations. Interesting cones or seedpods, attractive textures, foliage variegation, or bark. You’ll need decorating supplies – wreath rings, baskets, vases, or other items that can be used to create a beautiful winter arrangement, wreath or swag. Please bring items for yourself and any extras that you would like to share. The Chapter will have wire, oasis, and some ribbon. Bring your own pruners, wire cutters, gloves, containers for arrangements and ribbon. Another Greens Gathering feature…Gently Used Garden Book Sale! Fellow MG Sharon Baker has been busy gathering a great collection of gently used gardening books. Book prices range from .50 to $5 (a few books a smidgen more)! A perfect price for a perfect present for your favorite gardener. Though gardening is part art and part science, we shouldn’t take artistic license with the science part and defy the kind of sound information that can help us succeed. For years, Linda Chalker-Scott has been scouring the scientific literature, testing horticultural products under controlled, scientific conditions to support or disprove marketing claims, and challenging and disproving garden myths. *Designated for continuing garden education credit. One doesn’t need a lot of space-or time to grow fruit in the city, and this presentation offers proof! By using appropriate rootstock, espaliered apples and pears, summer pruning, efficient trellising, an innovative homemade irrigation system, compost, and remarkably pampered soil, Glen Andresen has managed to cram a lot of garden into his garden (and freezer). His presentation will concentrate on the labor-saving gardening principles and techniques he has pioneered and embraced so he doesn’t burn out as a gardener. With autumn settling in there was a flurry of activity to winterize our Demonstration Garden and Annex. Final harvests took place, annual vegetation was removed, rhubarb divided, cane berries pruned, cover crops sown, mulch spread, burlap placed to protect the soil, and tools cleaned and stored. A few more projects were finished up in the Annex…whimsical mosaic pavers were created, a couple of new garden beds were built, a gravel path finished up, and a weedy section mulched with cardboard. It was a very successful season of gardening, and learning. 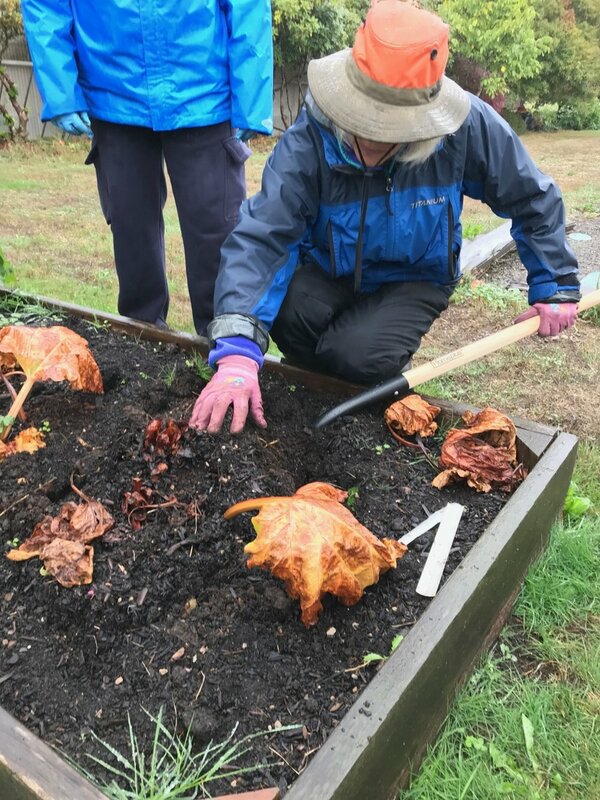 Sixty-four Master Gardeners spent over 2,479 hours to produce a record-setting harvest of 3,100+ lbs., of nutritious produce which was shared with area food banks and a health clinic. Though regularly scheduled work is paused through January, we’ll start up again in February with grand plans for more bountiful harvests, educational opportunities and, hopefully, an Annex green house! Please come join in! We’ll look forward to seeing you there. Time spent in the Demo Garden and Annex count as Volunteer Support Hours. Email a “Sign me up” message to receive Demo Garden updates at DemoGardenNews@gmail.com. We look forward to seeing you!